1. Feel free to leave a bag at the bell desk or concierge. If you don’t want to carry your toiletry going through TSA, just bring an extra duffle bag and leave the bag with the front desk or bell hop when you check out. Not only should you leave your toiletry, you should look to leave your workout gear, or any outfit for the climate. This works well if you are traveling to a different climate, you should always leave a jacket, sweater, fleece, etc. that you may not need at home. You’ll be lighten your load on your weekly commute and the people behind you at the security checkpoints will thank you for it! 2. 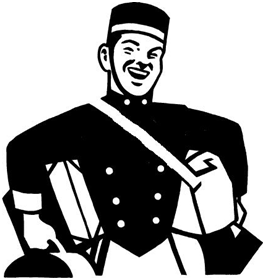 Always tip the bell hop or concierge if you’re asking them for a favor like holding your bag over the weekend. A good suggestion is $2-5 per bag (adjusting to locale and inflation), depending on your relationship. This goes along way with the staff – these guys are the heart and soul of the hotel. I typically tip on drop off and pick up. Sometimes a souvenir from your home has more mileage. For example, bring the hotel staff “I Love NY” t-shirts if you’re from NYC or some Ghirardelli chocolate if you’re from San Francisco. Your blog site was tweeted by a friend yesterday evening. Figured I’d give it a look. Best decision ever. Wow, awesome blog layout! How lengthy have you been running a blog for? you make running a blog look easy. The whole look of your web site is excellent, as smartly as the content! sociedad limitada no acepta ninguna responsabilidad derivada del empleo incorrecto de la información facilitad a través de sus páginas de internet.